What was the most popular keyboard with our customers over the past 12 months? In 3rd Place: The ever reliable, wedding and party favourite. The Yamaha CP300 Stage Piano. This full size, weighted keys stage piano is always a winner for those gigs where there isn’t a full band/PA set up. It’s in-built speaker system is good enough for the small venues, and the quieter gigs, like the bride walking down the aisle! In 2nd Place: The all powerful, sound packed workstation. The Korg Kronos 2. Not only does the Kronos 2 have a fantastic weighted piano sound to rival any stage piano, but this workstation also has 21GB of preset sounds. And 9 distinct sound engines for the synthesis of your own sounds. It is one of the industry standards for major studios, touring musicians, and musical theatre. It really is all singing and dancing! 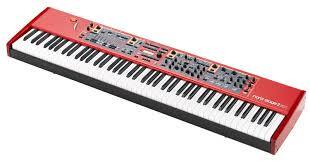 In 1st Place: The brilliant flagship of the Nord keyboard family. The Nord Stage 2 EX88. The Nord Stage 88 is the go to Stage Piano for so many gigging musicians, and touring bands. Nord have developed an ultra reliable hammer action, and the Factory Bank on the EX88 boasts 5 Grand Pianos, 7 Upright Pianos, 11 Electric Pianos, Clavinet, Harpsichords and a vastly improved Nord Sample Library selection including great new Strings, Choir and Folk instruments. The Nord’s separate sound sections of Piano, Organ and Synth make the keyboard incredibly user friendly. And the sound modelling for those classic keyboards is as good as you can get. This keyboard is the most popular amongst both professional and amateur musicians that come through our doors. It’s a winner for 2016! Will it retain it’s crown for 2017?